To share your work so that others can freely redistribute, build upon and improve your work, there are several special copyright licenses to choose from depending on what additional requirements you require (e.g, attribution credit). Use the chart above to choose the one that seems best for you. “NAME OF YOUR WORK” is © YOUR NAME, YEAR and shared with a Creative Commons Attribution-ShareAlike (CC BY-SA) 4.0 International license <https://creativecommons.org/licenses/by-sa/4.0/>. “NAME OF YOUR WORK” is © YOUR NAME, YEAR and shared with a Creative Commons Attribution (CC BY) 4.0 International license <https://creativecommons.org/licenses/by/4.0/>. “NAME OF YOUR WORK” is © YOUR NAME, YEAR and shared with a Creative Commons Zero (CC0) Public Domain Dedication <https://creativecommons.org/publicdomain/zero/1.0/>. “NAME OF YOUR WORK” includes “NAME OF COPYRIGHTED WORK” © COPYRIGHT OWNER NAME, YEAR which I have [modified AND/OR redistributed] under my Fair Use Right (17 U.S. Code §107 – Limitations on exclusive rights: Fair use) <https://www.law.cornell.edu/uscode/text/17/107>. Any additional work that is not already in the Public Domain is © YOUR NAME, YEAR and shared under a [Creative Commons Attribution (CC BY) 4.0 International license <https://creativecommons.org/licenses/by/4.0/> OR Creative Commons Zero (CC0) Public Domain Dedication <https://creativecommons.org/publicdomain/zero/1.0/>]. In Pirkei Avot,The Pirkei Avot are a collection of famous teachings of rabbis from late antiquity. Rabi Yehoshua ben Levi teaches that the 48th quality of the 48 qualities defining excellent students is they should correctly attribute the source of their knowledge.Pirkei Avot 6:6. This teaching may be attributed to Rabi Yehoshua ben Levi. Failing to do so threatens to “dissolve the world.” In the rabbinic understanding of cosmogony, creation itself is the product of exegesis. In Genesis Rabbah, the Creator looked into the Torah to create the world. The process of exegesis, requires attribution, and so without correct attribution by the Creator to the Torah, the product of the exegesis — the universe — dissolves. The importance of attribution doesn’t get any more tachlis (fundamental) than that. Rabi Yehoshua ben Levi proceeds to exemplify this teaching by attributing the 48th quality to Queen Esther who in the second chapter of the Scroll of Esther, verse 21, foils the coup de tat of Bightan and Teresh — by relaying warning of the coup to King Aḥashverosh in the name of Mordeḥai. Had Mordeḥai not been correctly credited with notifying the king of the murderous plot, he would not have received his belated thanks in chapter 6,At the beginning of Chapter 6, Aḥashverosh awake and unable to sleep opens up his chronicle of events in the royal court and discovers that Mordeḥai was never properly commended for his action. and Haman would not have endured the embarrassment that presages his downfall. A long chain of events connects the seemingly insignificant action of Queen Esther to the salvation of the Jewish people. The implicit lesson is that our everyday actions matter. The explicit message is that it behooves us to act correctly, especially in regards to attribution of credit. The point is that each one of Israel has a particular portion within Torah, yet it is also Torah that joins all our souls together. That is why Torah is called “perfect, restoring the soul” (Psalms 19:8). We become one through the power of Torah; it is “an inheritance of the assembly of Yaakov” (Deuteronomy 33:4). We receive from one another the distinctive viewpoint that belongs to each of us.Translation is Rabbi Arthur Green’s from The Language of Truth: The Torah Commentary of Sefat Emet (JPS 1998, p.121). Who would obstruct that kind of sharing? When a new work is created, copyright law doesn’t assume that a creative work was intended for sharing (with or without attribution). Instead, a creative work is immediately protected as private property — not only for the lifetime of the creator, but also for 70 years after their deathIf the copyright” of the work was sold, the work enters the Public Domain 95 years after it’s first publishing. — כֹּל זְכוּיוֺת שוֺמְרוֺת, Kol zchuyot shomrot, all rights reserved — to reproduce, distribute, and create derivative works based on it are forbidden, without the explicit written consent of the creator. 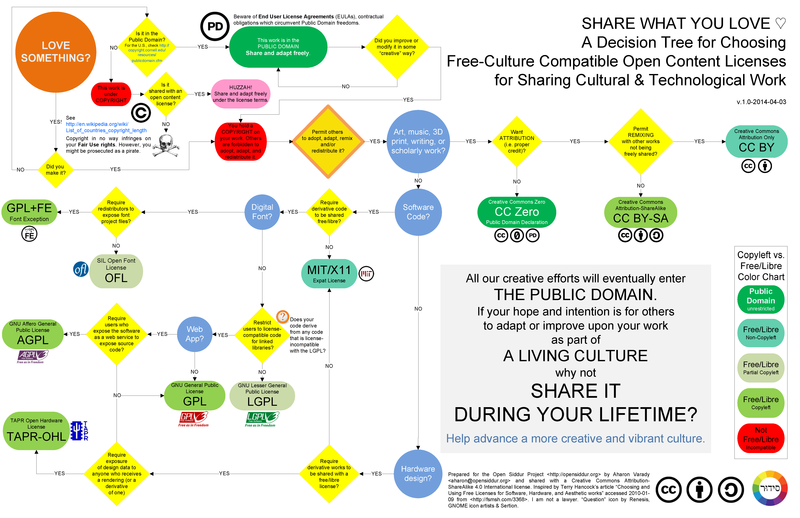 As stated before here at the Open Siddur Project, this might make sense for creators of new works and music, but it hardly makes sense for cultural projects with communal objectives which rely heavily and assert their authority on the authenticity of works in the Public Domain. The teaching and practice of Judaism is one such communal project. The promise of the Open Siddur Project relies on our sharing creative works and access to the vast corpus of work that we’ve inherited from our creative ancestors. That is why we so heavily depend and advocate for the adoption of open source, free/libre, and copyleftCopyleft “describes the practice of using copyright law to offer the right to distribute copies and modified versions of a work and requiring that the same rights be preserved in modified versions of the work. In other words, copyleft is a general method for making a program (or other work) free, and requiring all modified and extended versions of the program to be free as well” (“Copyleft” in wikipedia, accessed 2011-01-12). licenses — so that creative work, protected by default under Copyright law, can nevertheless be shared by creators who give their explicit permission to others to adopt, adapt, study, and attribute their work in new works that are similarly shared and distributed. 1. The Pirkei Avot are a collection of famous teachings of rabbis from late antiquity. 2. Pirkei Avot 6:6. This teaching may be attributed to Rabi Yehoshua ben Levi. 3. At the beginning of Chapter 6, Aḥashverosh awake and unable to sleep opens up his chronicle of events in the royal court and discovers that Mordeḥai was never properly commended for his action. 4. Translation is Rabbi Arthur Green’s from The Language of Truth: The Torah Commentary of Sefat Emet (JPS 1998, p.121). 5. If the copyright” of the work was sold, the work enters the Public Domain 95 years after it’s first publishing. 6. Copyleft “describes the practice of using copyright law to offer the right to distribute copies and modified versions of a work and requiring that the same rights be preserved in modified versions of the work. In other words, copyleft is a general method for making a program (or other work) free, and requiring all modified and extended versions of the program to be free as well” (“Copyleft” in wikipedia, accessed 2011-01-12). 7. 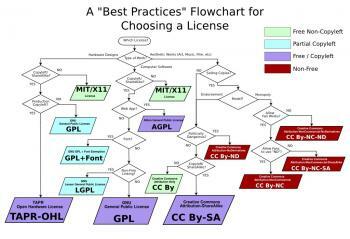 ”A Best Practices Flowchart for Choosing a License” by Terry Hancock, Free Software Magazine, 2010-09-26.